The buzz of recent economic growth in Buffalo is often tempered with the very real concern that Buffalo’s most economically disadvantaged residents will be shut out from the party. At a press conference Thursday, several community groups along with State Sen. Tim Kennedy and developer Sam Savarino announced a “high-road economic development” exception to the rule. In the sun-drenched, 3rd floor atrium of the still-under-construction building at 500 Seneca, living-wage jobs afforded to minority workmen and supplied to Savarino Companies by PUSH Buffalo and the Outsource Center—two organizations that have provided training and jobs for community construction projects—were celebrated. Though PUSH organizer John Washington “told the assembled that “It’s hard to measure the impact of investment in one person’s life,” he encouraged the workers on hand to say a few words about what the project has meant to them, and many of them did. Reggie Alls spoke proudly of the “long road” he’s witnessed the building take since he first started last November. “What we’ve done here should happen all over the country,” he said. The partnership between PUSH and Savarino Companies was forged when PUSH sought a contract for construction work on its multiple properties on the West Side. 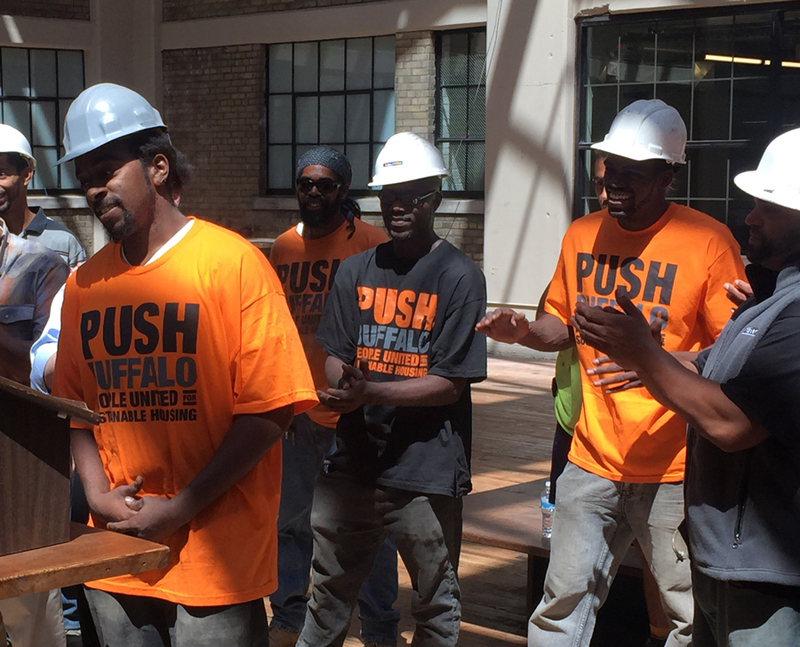 PUSH employs an in-house construction crew for projects that is 100 percent people of color, according to director Aaron Bartley, and structured into its contract with Savarino a proviso that would in turn employ workers at Savarino’s 500 Seneca building, paying $14-15 an hour with health benefits. 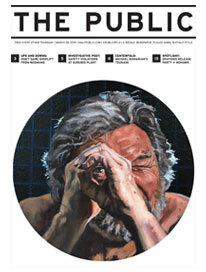 “For these guys, that’s life-changing,” John Washington told The Public.